The pigs at von Trapp Farmstead in Waitsfield are having a pizza party. Their keeper, Ignacio Villa, is throwing them crust after crust of day-old Red Hen Baking Co. pies. The brown, 9-month-old hogs — mixes of Duroc, Old Spot and Tamworth breeds — run for pieces of the local bread with the enthusiasm of canines in a disc dog competition, sans the high-flying moves. The pigs’ diet also includes spent grains left over from the brewing process at Lawson’s Finest Liquids in Warren. Clearly, these animals are eating well. But the foundation of their food pyramid isn’t the customary grain — it’s dairy. 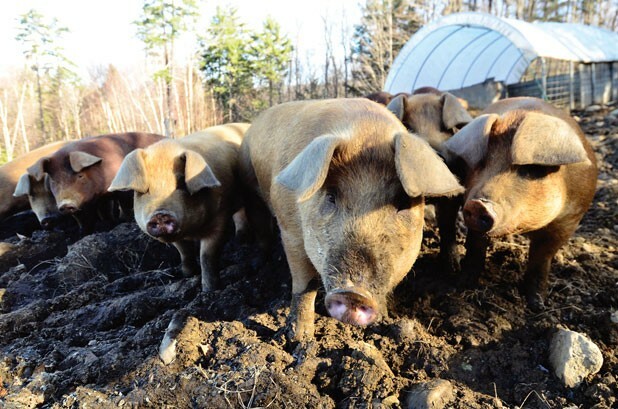 Meet the porkers behind Vermont Whey Fed Pigs, an emerging meat company run by Villa. After their pizza appetizer, the animals are ready for their main course of whey byproducts from the production of the Farmstead’s organic cheeses, including its popular flagship product, Oma. Villa, a lifelong farmer, is working with the von Trapps and other cheese producers to help raise pork for his company, officially launched earlier this year. Villa also markets whey feeding to farmers as a way to till fields. He demonstrates by pointing out one rolling hill at von Trapp Farmstead overlooking Camel’s Hump. It’s covered in green grass dotted with stones uncovered by the snuffling hogs. The area right next to it, untouched by the pigs and their nutrient-rich manure, remains desolately brown. Villa, 54, first worked at the von Trapp farm just after graduating from high school in his native Colombia, before the family’s cheesemakers, Sebastian and Dan von Trapp, were born. They began making Oma in 2009. About six months later, Villa, who was then working at a farm in Ohio, approached them with his business idea. He’s quick to point out that the concept of feeding whey to pigs is not a new one. The flutelike troughs Villa uses, with openings for porcine heads to pop in for a drink, are a Colombian design. In Parma, Italy, whey resulting from the manufacture of Parmigiano-Reggiano cheese has long been part of the region’s thriving economy of prosciutto and other cured pig meats. Villa hopes to achieve a similar synergy in Vermont. The von Trapps have now fed pigs their whey for several years, as has the Kehler family, which owns Jasper Hill Farm and the Cellars at Jasper Hill, where Oma and many other Vermont cheeses are aged. So far, most of that pork has ended up on the cheesemakers’ plates or those of their employees, but Villa has a further-reaching goal. He has begun creating guidelines not just for whey-fed pigs but for Vermont whey-fed pigs. With rules in place for everything from the percentage of whey in a pig’s diet to slaughter weight, Villa hopes soon to be able to label and sell meat marked as “Vermont whey fed,” much like the official “Vermont Maple” designation, both in and beyond the Green Mountains. But even after the guidelines have been solidified and approved, and his company has attained its goal of USDA certification, Vermont Whey Fed Pigs will still have a long way to go. Twenty pigs from von Trapp Farmstead will be slaughtered this year — not yet enough pork to create a movement. One encouraging sign: Katrina Razionale of the Cellars at Jasper Hill says her stock of swine has more than doubled recently. Above: Whey-fed pigs pose for the camera. Photo by Jeb Wallace-Brodeur. Willow Hill Farm in Milton sells whey-fed pigs independently of Villa’s small consortium, but Villa is working to recruit other cheesemakers, such as Spring Brook Farm in Reading and Consider Bardwell Farm in West Pawlet, to join the company. Producing pigs year-round is a key part of the model, but the eventual goal is to have monthly or even weekly slaughters. That would allow Vermont Whey Fed to sell plenty to restaurants, markets and value-added producers, both in and out of state. Some of those businesses have already tasted the difference in whey-fed meat. The butcher shop at Healthy Living Market in South Burlington has bought Villa’s animals and sold them from the case as chops and sausages. Adam Longworth of the Common Man in Warren says that, though his menu is usually cut driven, he bought his first half pig to support Villa. He soon ordered a second. Another of Villa’s clients is looking forward to the farmer’s promised whey-percentage guidelines. Pete Colman of Vermont Salumi joined Villa and the von Trapps on a trip to Italian whey-fed farms earlier this year. They visited small, local businesses, but also factory farms that use the method — the furthest thing possible from the decentralized system that Villa imagines in Vermont. “I think the danger in whey feeding is when farmers are like, ‘It’s cheap food; let’s pump ’em full of whey,’” Colman says. His concern that farmers might neglect grain feeding entirely is not unfounded, given the recent 20 percent spike in grain costs. Colman says he’s tasted whey-fed pork that was “wet and moist and kind of flaccid,” but he hopes establishing a protocol will eliminate this possibility in Vermont. For now, Colman is happy to buy 10 Jasper Hill pigs from Villa that will be slaughtered next month. But they will generate only about 600 pounds of sausage, a drop in the bucket for Vermont Salumi, which sells at local markets, online and at the small stand Colman attached to his kitchen at Cate Farm in Plainfield. What he doesn’t use in his sausages, he sells as butts, shoulders and other fresh cuts. Razionale says the five-year plan at Jasper Hill includes building a facility for on-site slaughter, processing and aging. The farm’s leadership is currently looking for the right person to spearhead the project, she notes. Another idea on the horizon is a line of sausages that combines the farm’s pork with chunks of its cheese. While such value-added products will best serve the luxury market, Villa and company are also aiming at home cooks on a budget. Sebastian von Trapp points out that private customers can buy a half or whole pig for $6 or $7 a pound. All they need is plenty of freezer space: A whole swine will most likely have a 225-pound hanging weight. Dan von Trapp believes Vermont Whey Fed Pigs and the forthcoming “Vermont whey fed” label will eventually carry the same Vermont cachet as the state’s cheeses. The official designation is “something that will follow us, even when we’re dead and gone. It’s something that will still be utilized,” he says. The perfect pairing on hors d’oeuvres plates — fine cheese and cured meat — could turn out to be just as delectable for Vermont agriculture.